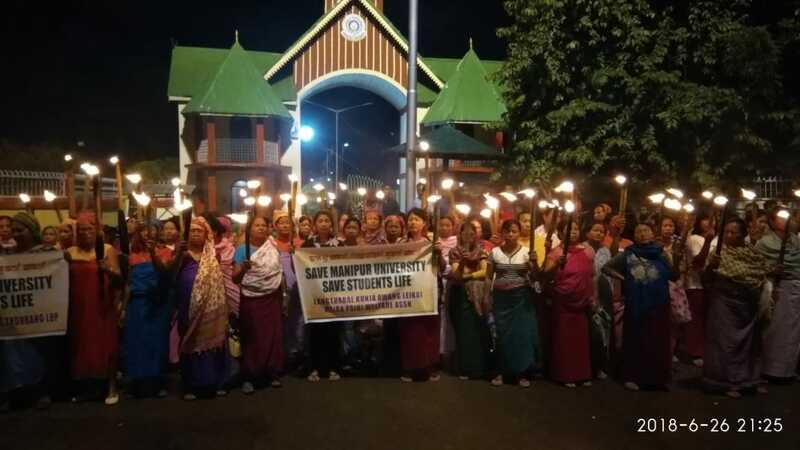 Demanding immediate amicable solution to the ongoing crisis inManipur University,women folk of the localities near the University staged a torch rally in and around the Canchipur campus near Imphalon Tuesdaynight. Carrying placards which read ‘Save Manipur University Save Students life’, representatives of various women bodies of Langthabal Kunja, Kiyamgei, Thongju, Kha-Naorem Leikai, all localities around the University campus in the state took part in the torch rally. Earlier on Tuesday intensifying the ongoing agitation demanding resignation of the VC, the Manipur University Students’ Union (MUSU), Manipur University Teachers Association (MUTA) and Manipur University Staffs Association (MUSA) jointly staged a day long sit in protest in front of university gate. MUSU launched an indefinite shutdown since May 30 demanding removal of VC Prof Adya Prasad Pandey over 15 point allegations of financial and administrative irregularities after he assumed the charge of VC since 2016. However terming the allegations against him as ‘false allegations’ , VC Prof Pandey told the mediaon Sundaythat the ongoing crisis will be resolved shortly. He was silent for more than 15 days on the issue. But he failed to give any time frame to end the crisis. On the other hand demanding VC’s resignation in the interest of “academic interest,” MUTA demands a high level enquiry commission to look immediately into the allegations against the VC and his side of the story in order to bring an amicable solution. Interestingly, MUSA joined the sit in protest demanding immediate end to the ongoing crisis in the University and bringing an amicable solution in the interest of the students and people of the state withinJune 30or the VC should resign on moral grounds. MUSA President S Jibankumar said that they’’ll launch other democratic form of agitation if the demands are not met within the above timeframe. Sharing a similar sentiment, people residing in and around the University also announced that they will extend necessary support to the movement until crisis is settled. At this juncture state Chief Minister N Biren Singh while addressing a function at BJP state unit office here said that he is trying his best to end the crisis. He even informed the gathering that the Joint Secretary of HRD ministry who recently visited the state to oversee the situation, informed him that an inquiry could be conducted to find out the facts relating to allegations and bring an amicable solution.